A Marine Corps veteran who decided to pull over to the side of the Beltway to help someone with a flat tire didn't expect he'd see the face of a man he had long admired. Anthony Maggert, of Stafford, Virginia, was driving on the Beltway Wednesday headed toward Walter Reed National Military Medical Center in Bethesda, Maryland, when he saw the man stranded on the side of the road. "I didn't know who it was. I just know that there's a vehicle, there's a person coming out of the vehicle that looked like they were in need. And I thought, 'well, nobody else is stopping,'" Maggert told News4. 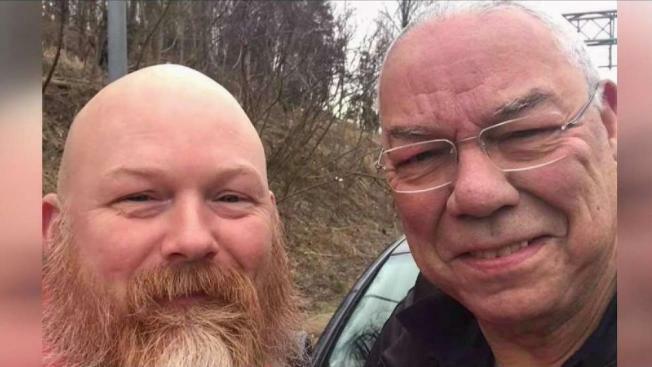 After he pulled over, he was stunned to see it was former Secretary of State Colin Powell. Maggert says he served 23 years in the military and did three tours in Iraq and two in Afghanistan, where he lost a leg after getting an infection. He said he has always respected Powell. "He led this fight during Desert Storm and Desert Shield. He had a huge impact," Maggert said. But it was Maggert who left an impact on Powell during their chance encounter. Powell wrote a long post on Facebook thanking him for his help. "Thanks, Anthony. You touched my soul and reminded me about what this country is all about and why it is so great. Let's stop screaming at each other. Let's just take care of each other. You made my day," read part of his post. Maggert said the attention from Powell's Facebook post has been surprising. "You feel great. But it sort of made my day too. I guess you always feel kinda good if somebody is in need and you can reach out and help them out," he said. Powell, coincidentally, had also been on his way to Walter Reed for an appointment that day. "In fact, he was two cars behind me as we went through the gate," Maggert said.